This Advent hymn dates back at least to the 7th Century. At one time it was attributed to St. Ambrose, but his authorship is no longer considered likely. It has long been sung during Advent, especially at Vespers services.. 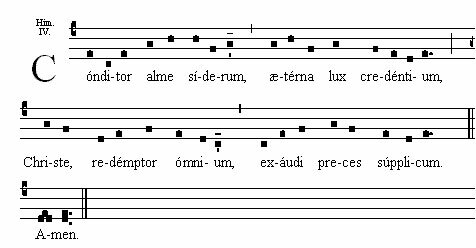 This chant has served as the basis for motets written by many composers, including Guillaume Dufay, Orlande de Lassus, Giovanni Luigi da Palestrina, Tomás Luis de Victoria, Ludwig Senfl, and Michael Praetorius. hear the petitions of your suppliants. giving the remedy to all things. womb of a Virgin Mother. acknowledging themselves submitted to his command. from the dart of the treacherous foe.